In 2011, Brotherface got married to a darling woman I am happy to have as a sister-in-law. 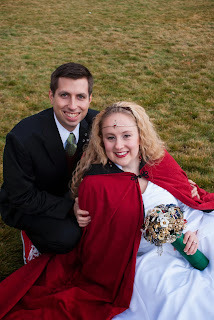 In 2012, I got married! In 2013, Sisterpants got engaged and will be married in spring of 2014. I've spent some time with her betrothed, and I am fond of him as well. During summer 2012, when I brought Blake home to meet my family, all eight of us (my parents, Mr. and Mrs. Brotherface, Sisterpants and The Boy She's Going to Marry But I Can't Honestly Remember If They Were Dating At The Time, and Blake and me) went river rafting down the Provo River followed by a family picnic. I think Future Mr. Sisterpants also came over for Sunday dinner that weekend too. Even though we didn't know that we'd all be one big happy forever family then, it's fun to think about now. Future Mr. Sisterpants was also at our wedding reception, which I'm grateful for in light of future events. The great news is that we all got along, the newbies fit in well with everyone else, and I'm really looking forward to this new family dynamic being official! Also, in putting this post together, I was struck by how much my siblings' (future) spouses look like us, being of similarly average height and blonde haired. Blake, on the other hand, is tall and dark haired. I'm grateful my family let him in anyway. There are a lot of similarities between my siblings' spouses and weddings that don't apply to my spouse or our wedding. Someone has to do things differently! I think the world needs more stories of in-laws who are straight up family and not nightmarish in-laws. I love my in-laws, both the ones I gained through my marriage and the ones I gained through my siblings' marriages.